Most of life is about perspective. Do you look at a bee and see a stinger or a flower pollinator? Do you look at the ocean and see monsters or calm and new discoveries. Your perspective on an event or circumstance can determine whether or not you enjoy your experience. 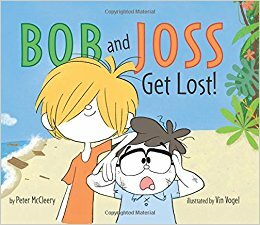 In Bob and Joss Get Lost!, a picture book written by Peter McCleery and illustrated by Vin Vogel, Bob and Joss have two different perspectives. Bob is bored so Joss suggests taking a boat trip. Bob doesn’t like the idea. He thinks they will get lost. Joss doesn’t agree. The two end up going on a boat trip and their reactions to the circumstances that follow illustrate how each boy’s interpretation of events transforms their situation into either a fun or a scary experience. The two boys’ personalities play off of each other in a comical way. Joss remains calm and cool while Bob freaks out. Joss goes with the flow while Bob sees danger around every corner. Kids will see the two boys’ perspectives depicted in their facial expressions and body language. They might try to predict where Joss is getting his treats and why Bob doesn’t notice. If your kids enjoy picture books with funny dialogue and lots of action, they will enjoy going on this journey with Bob and Joss. They might even find relief from boredom…for a little while.